At the beginning, there was the desire to build a simple game by ourselves. 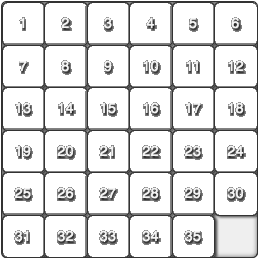 The «taquin» («teaser» in French - aka «15 puzzle» or «fifteen puzzle»), which had (with the Rubik's Cube) its heyday in the '80s was an interesting choice, because programming the movements of the game tiles and the detection of the final result did not require major algorithmic knowledge. Then, on the occasion of a family birthday, came the desire to offer our close relatives a small game in which the final reward for success would be the display of a photomontage evoking common memories. The «taquin», known to all, was a perfect candidate. During the development of the game, and pending the finalization of the photomontage, the choice of a test image has naturally led to Lenna, which has been an industrial standard since the '70s amongst image processing developers. Once finished, the game met with great success in our family. The enthusiasm of our close relatives encouraged use to build this website, so that everyone can discover or rediscover this nice little game.